As a former Financial Aid Officer at a college I have become intimately familiar with the dangers of waiting until the last-minute to submit a FAFSA. 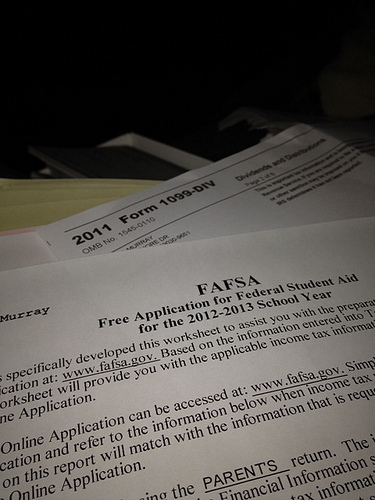 Most people are not aware that as of January 1st, 2013, students are able to submit their 2013-2014 FAFSA for the upcoming 2013 Fall semester. The majority of colleges and universities have strict deadlines that must be met to be considered for financial aid. Missing these deadlines can have disastrous effects on your financial aid award letter. Almost every institution of higher learning also has internal scholarship programs that can be accessed as additional sources of financial aid. All in all, the old adage “the early bird gets the worm” holds true. A lot of institutions have grant and scholarship programs that are awarded on a first come first serve basis. File FAFSA BEFORE Filing Your Taxes! Another bit of useful information for students and parents is that you can actually submit your FAFSA without having filed your taxes. On the FAFSA, when it asks you if you have submitted your 2012 tax returns, simply select the “I will file my taxes” option. Then once you have submitted your 2012 returns, simply log back into the FAFSA with your FAFSA pin and complete your tax information. If you have filed for an extension, this lets you submit your FAFSA while your taxes are still being processed. Today is May 23, which means that many of the deadlines for the Fall 2013 semester have already been missed. It is not too late however to continue applying for more scholarships and grants to help earn more money for college. Applying for free money for college will help you avoid taking out student loans and avoid the burden of paying back student loans after you graduate. By taking advantage of the financial aid available on your campus you can maximize your changes of that elusive “free ride” to college. You can check the local public library or your local high school guidance office for excellent scholarship opportunities. I encourage you to apply for as many of them that you qualify for! Take advantage of ALL scholarships and grant programs by being one of the first students to submit their FAFSA for the upcoming school year. Contact your financial aid office if you have any questions, they will be more than happy to help you.